Just a short drive downstream from the Niagara Falls, the attractive town of Niagara on the Lake is undeniably one of Ontario's prettiest tourist destinations. Enjoying a beautiful setting right next to Lake Ontario, Niagara on the Lake offers a subtle, yet well-developed tourism infrastructure, with plenty of shops, restaurants and events, including the famous George Bernard Shaw Festival, as well as free classical music concerts in summer, at Simcoe Park. Many notable vineyards and expanses of parkland surround Niagara on the Lake, providing plenty of interest and appeal. Formerly a Native Indian village and briefly the capital of Upper Canada, some two hundred years ago, the town is especially close to the American border. Queen Street serves as the main drag, being home to the Tourist Information Center, at the Court House building, together with a historical clock tower and the Apothecary - an unusual and very popular museum recreating a pharmacy from the 1860s. The tourist attractions around Niagara on the Lake may be somewhat overshadowed by the relative proximity of the world-famous Niagara Falls, although they certainly compete well for your attention. Over 30 different wineries are located close by and tourists frequently enjoy a day exploring the most popular of these, sampling the wines and stopping off for a spot of lunch. Others prefer to relax at the Queen's Royal Park, where picnic tables overlook the adjacent Niagara River. For a bit of excitement, do consider a high-speed jet boat tour of the lake, or an evening ghost walk around the town. 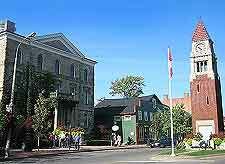 More information about Niagara on the Lake Tourist Attractions. A number of very important National Historic Sites are spread around Niagara on the Lake and offer an insight into the region's past, particularly the war of 1812. 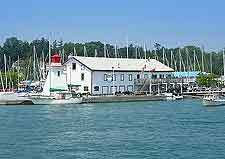 These landmarks include the Fort George National Historic Site at Queens Parade Park, and the Fort Mississauga National Historic Site ruins, which are to be found alongside the Niagara on the Lake Golf Club. Within the Memorial Park, the historical Butler's Barracks are yet another notable national site in Niagara on the Lake. Playing an integral part of the Shaw Festival, the Court House Theatre hosts many quality plays, along with the Royal George Theatre and the Festival Theatre. 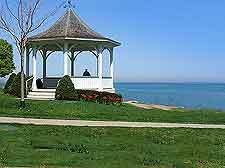 More information about Niagara on the Lake Landmarks and Monuments. When it comes to museums, Niagara on the Lake has little to offer, other than its Apothecary. However, the town's National History Museum on Castlereagh Street is often of interest and dates from the early 1900s, being one of Canada's oldest museums and filled with interesting information about the town's history. More information about Niagara on the Lake Museums. 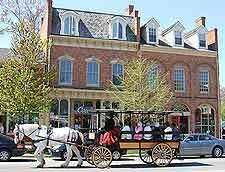 Many places of interest are close to Niagara on the Lake, with day trips to the nearby city of Buffalo, in the state of New York, being especially enticing. Also within reach are the twin cities of Kitchener and Waterloo, although these destinations are often overlooked in favour of the rather touristy city of Niagara Falls, as well as Toronto, which lies to the north. Tourists with time on their hands may like to take a drive along the very scenic Niagara Parkway. More information about Niagara on the Lake Attractions Nearby.